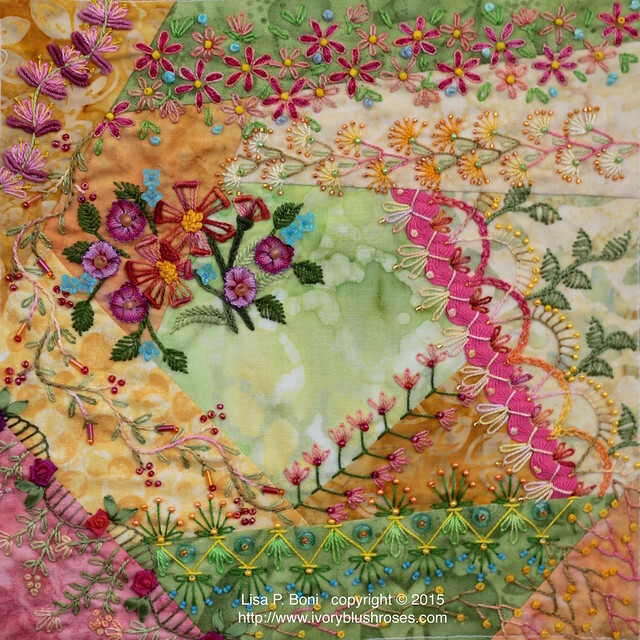 At long last, I finally finished my February block for the CQJP 2015! Between many projects for other people, working on my first CQ class curriculum and sample, articles, and round robins, I didn't have much chance to stitch on my own projects for the past three months. How good it is to finally be finding some time for my own projects! It took a bit of work, but the block balances well with the first block. I learned some good lessons along the way. Namely, that the bright pink rick-rack was probably a bit strong for this block. I wish I'd realized it in time to remove it before I'd done so much stitching over it that it was next to impossible to remove. I also learned that when working with bright colors, the balance of color value is very important when looking at the block as a whole. 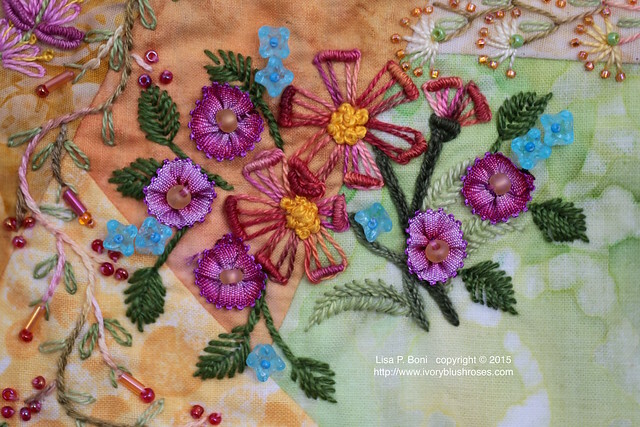 When I first stitched the seam of pink lazy daisy flowers, I realized it was far too light for the block and so added a deeper pink in the center of some of the petals. It wasn't nearly enough and it made the whole block fade into a medium value that had no interest. I went back and added a deeper pink shade and finally the seam balanced well with the rest of the block and brought the block to life! 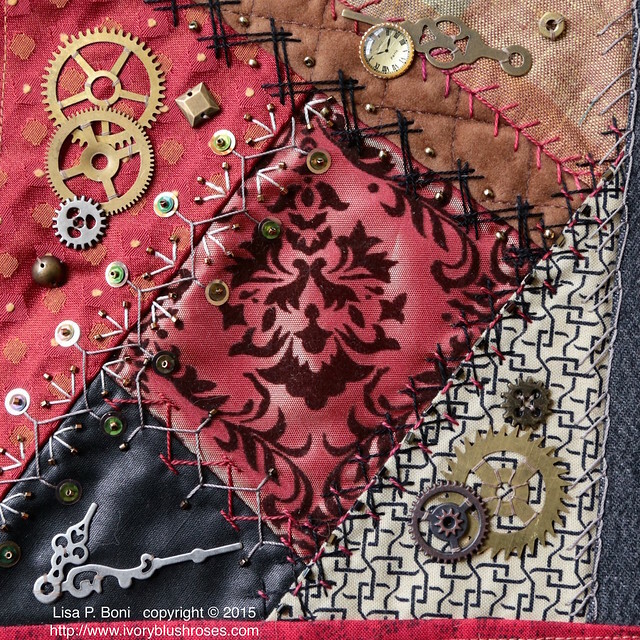 As on the first block, I really looked for ways to extend seam treatments into the rest of the block to give it an overall tapestry kind of look. I played with brighter colors on this block to offset that rick-rack. More Mokuba ribbon flowers and I tried out some other blossom types that I had not made before. Some little blue glass flower beads added just the right accent. Now I'm anxious to move on to block number three and to get started on my second set of blocks, which I think I'm going to turn into my basket quilt! I also finished up another Steampunk round robin block. This one for Colleen. One more block to go for Wilma and this round robin is complete! 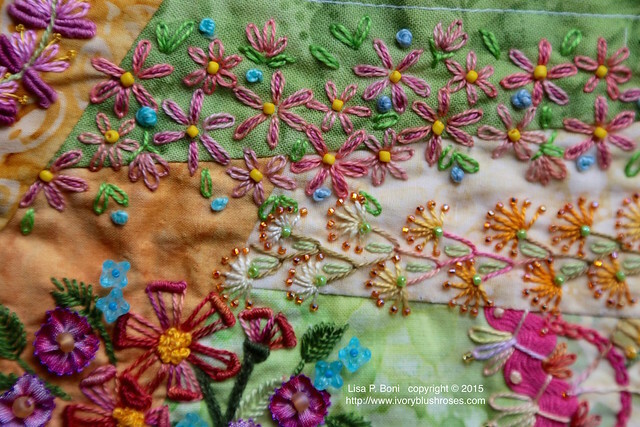 Even with all the stitching, I found a little time to play in the garden! I made a stop at a thrift store/flea market and found the sweet bunny, which goes perfectly in the big iron cauldron! 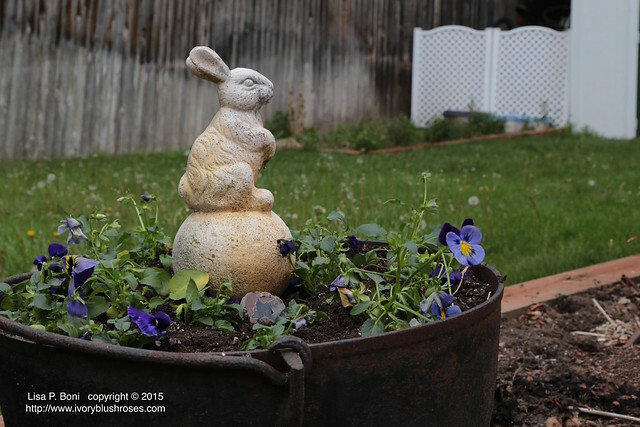 Some purple pansies will be accented with some other flowers as the season warms. Still a risk of frost or snow here for a few more weeks! We've been enjoying some rain in the meantime! 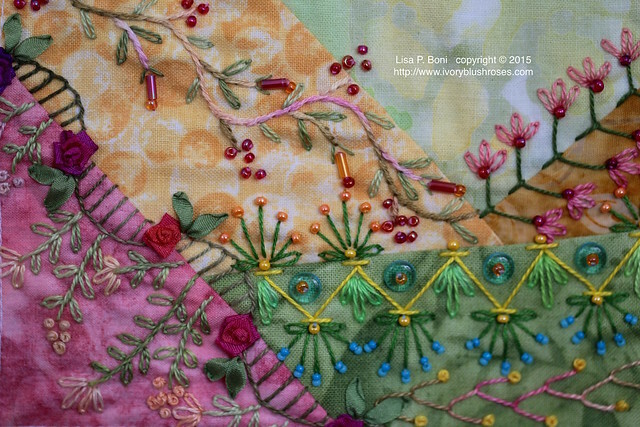 Lisa, Both squares are great but I just love your February block. Flowers are my fav! 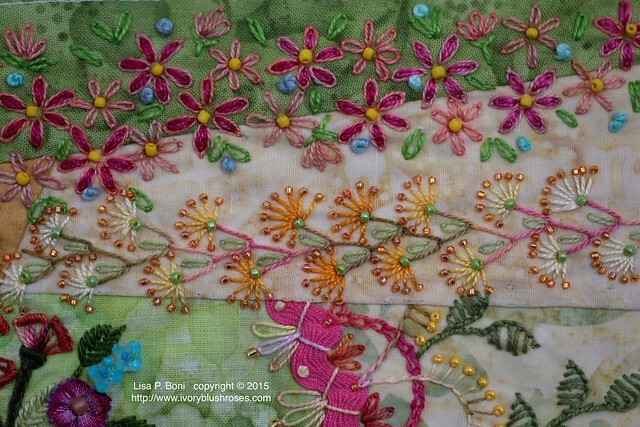 Oh my gosh, your February block is filled with wonderful stitching. More inspiration for me. Thank you for sharing. I love your totally stitched blocks. 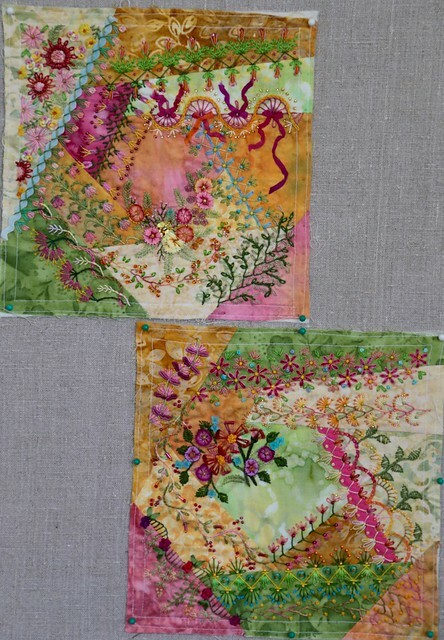 Your stitch combinations are so beautiful and complimentary. I love your work. 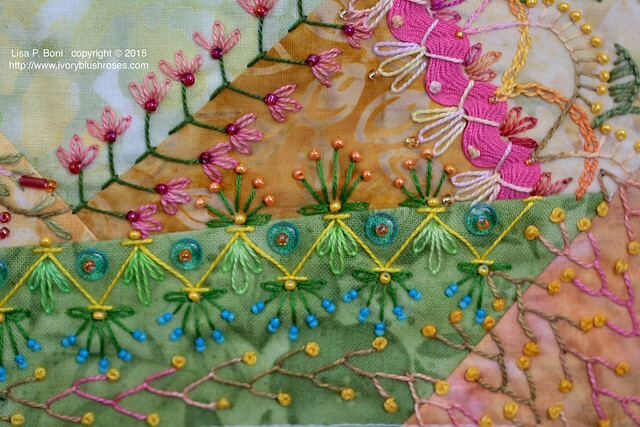 It is so totally inspirational to those of us that are new to crazy quilt. Love love both blocks! Your stitching is fabulous! PS it was a nice meeting you we did have a wonderful day! Wonderful blocks (all three!). Thank you for the notes about your through process with the design. Lordy, those blocks are gorgeous! I think you said early on that those colors were outside your comfort zone, but they sure make spectacular blocks. I love the bright pink ric rac! I think it plays very nicely with the pink in the centre of the other block. As always your work is beautiful and very inspiring! Wow, that is absolutely beautiful! So glad I found your blog. I'll be following.